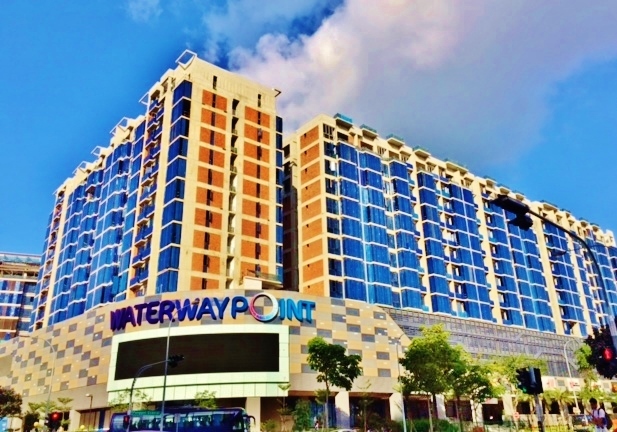 Waterway Point is a commercial building located at Punggol Central in District 19. Above Waterway Point lies the upcoming new condominium Watertown which has 900 residential units. This beautifully designed architecture is expected to be completed in 2017 by the reputable Far East Organization, Frasers Centrepoint and Sekisui House Ltd. Waterway Point is a $1.6 billion investment to develop the new Watertown project. Waterway Point is a commercial mall make up of 4 levels inclusive of 2 basements. The commercial units here will be used for F&B, Retail, entertainment and other miscellaneous units. The Shaw Imax cinema will be located at the basement and it has about 1000 seats. There will also be a 24 hours operating NTUC Fairprice Finest outlet at the basement level. Waterway Point is a commercial property that is strategically located at Punggol Central in District 19. The nearest Mrt station is Punggol Mrt/Lrt station which is 0.2 km away. Other nearby stations are Buangkok and Seng Kang stations. There are also several bus services nearby. Major expressways like CTE, TPE and KPE allow you to get to many places effortlessly. Driving to Marina Bay District and Central Business District will take you about 20-25 minutes. It is seamlessly connected to the rest of Singapore saving commuters transport time. Malls: Nearby mega malls like Waterway Point Mall, Rivervale Plaza, Rivervale Mall, Hougang Mall, Compass Point, Punggol Plaza and many more others which have a myriad of amenities like eateries, retail shops, supermarkets and banks. For more shopping, dining and entertainment purposes you can head down to the Orchard shopping district and Marina Bay District which is about less than 20 minutes’ drive away. Restaurants: For more dining options to satisfy your taste buds, head down to the restaurants along Punggol point or eateries in Sengkang and Pasir Ris. Condominiums: There are also several prestigious residential buildings like A Treasure Trove, Flo Residence, Parc Centros, Park Green, Prive @ Punggol, River Isles, Riversound Residence, The Quartz and The Luxurie which are highly sought after by locals and expats. Supermarkets: The nearest supermarkets is Cold Storage at Compass Point, NTUC Fairprice at Rivervale Mall, Sheng Siong Supermarket at 301 Punggol Central and Prime Supermarket at 108 Punggol Field. Healthcare: For medical consult, you can head SengKang and Pasir Ris Polyclinic, Ren Ci Hospital, Bright Vision Hospital and Changi General Hospital in the area to provide specialist healthcare services for the residents. Education: Edgefield Primary School, Horizon Primary School, Compassvale Primary School, Rivervale Primary School, Greendale Primary School, Punggol Primary School and Sengkang Primary School. The Secondary Schools in the neighborhood include Sengkang Secondary School, Greendale Secondary School, Compassvale Secondary School, Mee Toh School and Punggol Secondary School. Recreational facilities: There are many recreational facilities around here include Punggol Promenade, Punggol Waterway Park, Punggol Point, Marina Country Club, Sengkang Riverside Park, Sengkang Community Hub, Sengkang Sports and Recreational Centre. Places of worship: For places of worship in this multi-racial and religion society, one can head to Fo Guang Shan at 1 Punggol Place, Sheng Jia Temple at 3 Tebing Lane, River of Life Community Church at 19 Ponggol 24 Avenue and Central Christian Church at 1 Edgefield Walk. Waterway Point is definitely a highly sought after commercial building as it is located near to Punggol District. There are a myriad of facilities in-house and nearby to cater for all your needs. For more details, please contact the relevant personnel.